Q: What is the best way to ask for a recommendation from a contact? Recommendations are a great way to highlight the quality of your work and your skill set while serving as an impactful self-promotional tool. They can take different forms – whether it’s a testimonial on a website, a letter of reference, an employment verification (or phone reference), or a recommendation on LinkedIn. The latter is particularly easy, as LinkedIn has a dedicated functionality and form that you can use to request recommendations from a first-degree contact. This takes the awkwardness out of emailing or messaging the person, and it’s a commonly used feature. Other formats might require a different approach. 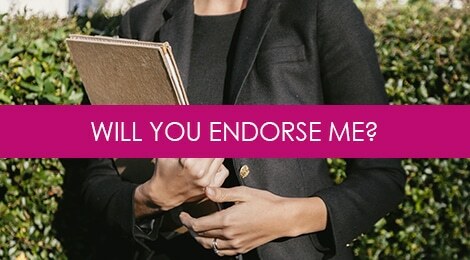 First, think about who you want to solicit for a recommendation or reference in terms of 1) their relationship to you – which should be professional in some regard, and 2) the capacity in which they can speak to your experience and skill set. This might be a former or current supervisor, a direct report whom you managed, a colleague or peer, or even someone outside of the organization, such as a customer or vendor. The capacity in which you’ve worked with these people may differ, and their individual testimonial can offer a particular value. Likewise, including recommendations from a range of individuals that show different working relationships can provide a broader picture of your capabilities and contributions. I find people are often more receptive to writing a recommendation if you educate them on exactly what you’d like them to communicate in the reference. In some cases, your contact may request that you prepare a draft of the recommendation that they can edit and approve. At the very least, it is helpful to offer to provide your contact with a couple of key points around which they can construct the recommendation. This makes it easier on them and gives you more control over what’s presented on your behalf. As you may know, I am in the process of starting my job search and would love to have a strong portfolio ready to present to potential employers. As part of that, I’m looking to put together a couple of references/recommendations from people whom I respect, and who I feel can speak to my skill set and experience. I was wondering if you would be willing to write a brief recommendation on my behalf emphasizing my experience in [X, Y, Z]. I’m happy to put together a couple of thoughts or a rough draft if that would save time for you. Tags: career, interviewing, job search, LinkedIn. Bookmark the permalink.